It’s another book review and another giveaway!! Yay!! This one is a review for the newly released book, Creating Glass Beads by Jeri L. Warhaftig. This book contains a bunch of really cool glass bead projects. I’m loving the Glass Momento bead that allows you to create a window to put a picture in once the bead has been finished. I’m also loving the Silver Butterfly bead which incorporates fine silver paste and the usage of a bead press. Both very helpful things to learn about. One of the coolest aspects of this book though is how Jeri brings in project testers, other bead makers, to give their spin on the projects in the book. Another very helpful addition. I highly recommend this book for both the beginner and the more advanced bead maker. Now if you’re interested in getting ahold of a copy of this fab book drop me a comment. Deadline for entries is next Friday, March 25th. And finally this giveaway is for US residents only. Thanks!! Oh, Lark puts out such beautiful books! Please enter my name. Thanks. thanks for the giveaway! this looks like a great book. This book looks awesome!!! I sure could use it! The cover of the books shows some fun ideas with bead work. I like different items and looks. Love to have this book!!! Wow sounds like an interesting book. 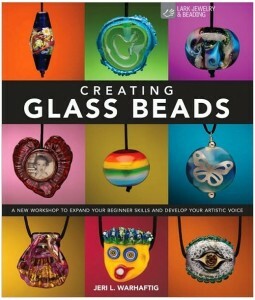 I would love to have the chance to read this book and give glass bead making a try! in the learning process. Thanks! Wow! This book looks awesome! I’m Just starting to get ahold of the whole jewlery/bead crafting world. So I would love to get a book like this! I think it’s so cool that some of the beads are going in space! I would really like to have a copy of this book. I love Jeri’s story and what she is doing for Beads of Courage. And to have one of her beads going into space. WOW! This is new for me to try. But since I love anything that is “a one of a kind”, this book would be a good start. i want to learn how to make beads and am hoping to take a class soon! this book would be a big help to motivate me! I’d love a chance to enter!! This is a craft i would really like to get into! I would love to win this book to help me get started! Have just started learning this, and more info would be JUST the thing!! Would love to win this! Thanks for such a great book giveaway. Sounds like a really hot book. I would really like to win it. Thanks for the giveaway. Have a wonderful week. I would like to learn how to make glass bead to incorporate them into my silver jewelry. I always like to learn new techniques, especially the ones that require getting more tools. I have a torch, glass rods and all the equipment, but I have never made a bead! I am really unsure of where to start and would love to have this book…it may just get me to have the courage to start! This fascinates me would love to try this craft, so please do drop my name in the hat! Who knew glass could look so good! I’d love to win! I have an obsession with new crafting books! Looks like another great book from Lark. I’d sure like to own it!